This is not your average 15 year-old's MySpace page. 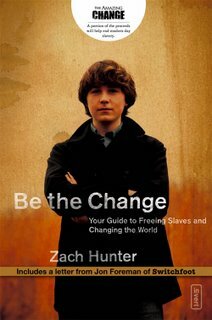 You know it's different, when you see the teenager boldly proclaim "I'm Zach Hunter, and I'm a abolitionist." Zach is working to abolish slavery worldwide through a campaign called "Loose Change to Loosen Chains" that he began in the 7th grade. Zach's book, "Be the Change", was published earlier this month. While we may think that slavery ended 150-200 years ago, the grim reality is that there are twice as many slaves in the world today as there were 200 years ago. 27 million men, women, and children are still enslaved around the globe. The worldwide problem of slavery is receiving renewed and much deserved attention with the upcoming release of the movie, "Amazing Grace" on Feb. 23rd, which chronicles the story of British politician William Wilberforce's efforts to end the slavery trade. Wilberforce's mentor was John Newton, the slave-trader-turned-song-writer, who wrote the world’s most popular hymn, Amazing Grace. Our church participated in Amazing Grace Sunday today, and it is encouraging that thousands of churches participated worldwide and made a commitment to abolish slavery. Hopefully, every participating church and individual who prayed for an end to slavery will put action to our prayers and follow the example of a 15 year-old boy named Zach. However, if we just go about our business and do nothing, then the consequences will be tragic - not for just a few people or even a few thousand, but for 27,000,000 men, women and children worldwide.